A Natural Paradise for Birders! Lochinvar National Park has exceptional beauty and outstanding birding opportunities. Over 421 bird species have been recorded in its 428 square kilometres. 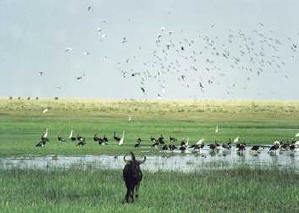 The park is located on the Kafue Flats and is Zambia’s largest bird sanctuary. The park is situated on the southern edge of the Kafue Flats. This is a wide floodplain of the Kafue River between Itezhi Tezhi dam in the west and Kafue Gorge in the east. The area extends for 33kms from the Kafue River in the north to low wooded hills in the south. Opposite the park but slightly north is another small park the Blue Lagoon National Park. Lochinvar is considered as a birders paradise because of its large estate of bird life. The Kafue Flats floodplain is in the northern section. It gets flooded by the Kafue River. The floodplain is where you meet thousands upon thousands of the endemic Kafue lechwe. This antelope is one of the three subspecies of lechwe found in Zambia. More than 30,000 of them make the flats their home. They move seasonally from one area to another according to the flood level. Other antelopes found here are the blue wildebeest, kudu, zebra, oribi and one of the big five, the buffalo. There are no dangerous animals in the park, apart from the buffalo. Other animals are bushbuck, baboon, bushpig and vervet monkey. Visitors are encouraged to walk about. The Gwisho Hot Springs occur along a geological fault. Lush vegetation and vegetable ivory palms surround it. The water of the spring rises by convection from a depth of over 1 kmw The water temperatures ranges from 60° to 90° C. There are high concentrations of sodium, chlorine, calcium and sulphates in the water. In the park there is a large Baobab Tree with a hollow trunk. Its large enough to allow several people to sleep in. The tree is said to have mystical special powers which would protect passing travellers from wild animals. Not far from the lodge are rocks known as Drum Rocks because they produce a resonant sound when tapped. The floodplain is a wide and almost flat area, with black clay soils, sloping almost imperceptibly towards the Kafue River. Vegetation is made up of grasses, sedges and herbs adapted to an annual pattern of flooding. Many plants grow up with the rising waters to become emerging aquatics at high flood. A few isolated winterthorns, Acacia, albida and palms borassus aethiopum occur on the river banks. Lochinvar is well renowned as a superb bird sanctuary featuring many different waterfowl, raptors, woodland species and migrants are especially abundant. Hundreds of wattled cranes can be seen feeding on vegetable matter dug from the soft mud and the large marabou stork can be seen scavenging for stranded fish. Around Chunga Lagoon you’ll find the greater and lesser flamingo, the pink backed and white pelicans, African skimmer, caspian tern, baillon’s crake and the red knobbed coot. Many species of waterbirds such as duck are abundant in this environment; the black duck, fulvous duck, whistling duck, pintail, garganey, southern pochard, pygmy goose, yellow billed duck and the Cape and European shovellers. Waders include avocet, the mongolian, caspian and pacific golden plovers, whimbrel, turnstone, sanderling, little stint, spotted redshank, black tailed and bar tailed godwits and six species of sandpiper. 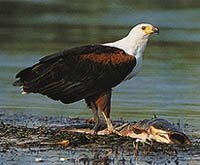 There are over 50 raptors including the black sparrowhawk, osprey, secretary bird, African cuckoo hawk and the peregrine falcon to name a few. Other interesting sightings include the white-bellied and black bellied korhaans, yellow throated sandgrouse, narina trogon, and Denham’s bustard. You can find more information an article on birds of Zambia . Many other bird types are found in other national-parks . Birds are beautiful and add elegance to the Zambian Tourism .